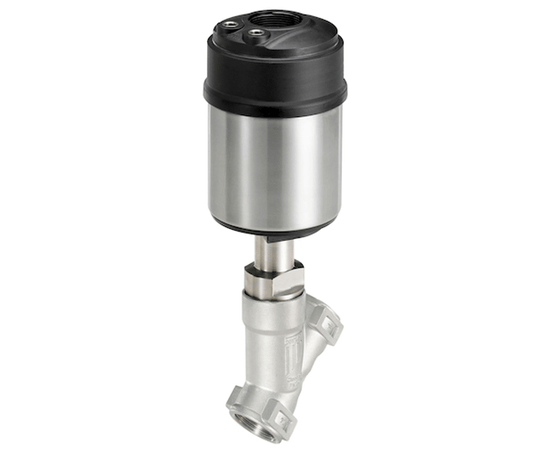 The 2300 angle-seat control valve is optimised for tough process environments. It meets EHEDG hygienic engineering guidelines for materials compatibility, have smooth surfaces and external seals, and are resistant to cleaning solutions. It is part of Burkert's range of ELEMENT valves, radar level sensors and analytical field transmitters, which work together as part of a modular programme. Products combine in an array of configurations to suit specific processes. They provide extremely compact integrated actuation without external air lines, and have a contactless, wear-free, analog displacement transmitter. Simple and reliable drive adaptation is provided using automatic TEACH calibration between parts. An on-board air filter has integrated control air channels.